Riga Hobby Greenhouses are one of the strongest greenhouses you can buy for the money. Their unique "Onion" shaped design offers optimal headroom inside, but with enough slope on the outside so that heavy snow loads slide down and severe winds easily pass over the greenhouse. This helps create a sturdy, compact and ideal growing environment for growing fresh vegetables, herbs and flowers, even in the middle of winter. 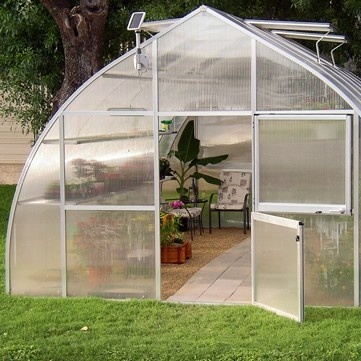 The unique design of the Riga Greenhouse also has one of the best ratios between aluminum framing and polycarbonate panels, which allows for maximum light transmission and less "moving" shade. Available in 9' Widths. Standard series for best overall use. Available in 7' Widths. Slim series for smaller spaces. Available in 14' Widths. Extra thick panels for amazing insulation. Riga shelves, staging tables, heaters, base kits and more. WHY BUY A RIGA GREENHOUSE? •	The RIGA is truly a greenhouse by the European definition of a greenhouse - designed to be used to grow fresh vegetables, herbs and flowers in the middle of winter. While other so called “greenhouses” using less than 8 mm twin-wall polycarbonate, are considered to be Season Extenders, to be used when only a slight night frost might be expected during the spring or fall season. At best they can only be used to house established plants during the winter season. •	The RIGA Greenhouse is designed, engineered, and manufactured in Germany by Hoklartherm, a leading manufacturer of commercial and hobby greenhouses, sunrooms, pavillions, pool covers, home additions, and commercial building, with 28 years experience. 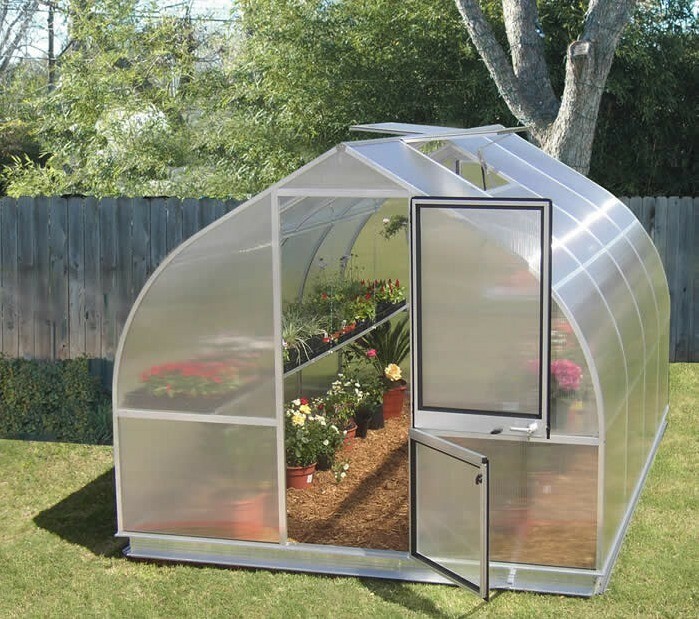 •	With a combination of strong materials and durable hardware, the Riga Greenhouse is one of the strongest greenhouses under $5,000. •	The Riga Greenhouse offers more window and door ventilation than another units it is class. 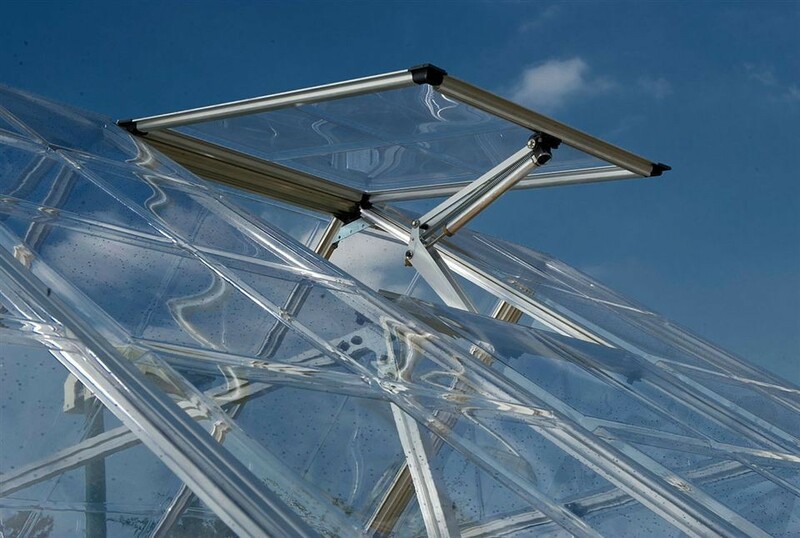 •	The polycarbonate glazing on the Riga Greenhouse is German made and believed to be of superior quality. •	The Riga Greenhouse comes with an optional two layer shelving system with removable shelf inserts. This allows for tall plants (beans, tomatoes etc.). •	The optional 6" high base frame (which is often used to increase the height of the roof), is 2-3" higher than most competitors. •	One major advantage of the Riga's construction method is that the frame profiles are permanently attached to each other, and won't come loose over time due to wind pressures. •	German engineering - guaranteed top quality! •	The RIGA Greenhouse's optional top shelf hangs forward – easier to reach, but also does not block outside light from reaching bottom shelf. •	Both shelves use twin-wall polycarbonate as the insert (the flat part) material, allowing for much better and more even light distribution through the greenhouses. Most other types of shelving are dark structures which do not let light through – or very badly at best. 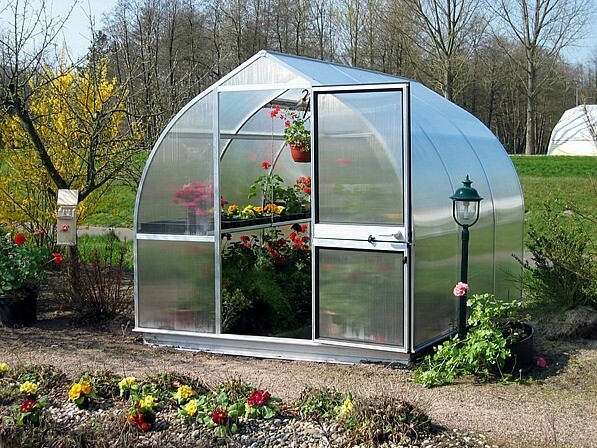 •	The RIGA Greenhouse is attractive and beautiful to look at – fits well in to an upscale garden setting. •	The RIGA Greenhouse offers the minimum insulation needed to grow plant year-round – others using less insulation cost too much to heat. •	Inside walking height: 6’1” near shelves, 6’11” in the middle of the narrow unit and 7’6” high for a wide unit. •	Base frame - 6” high: highly recommended. Attaches to the bottom of the greenhouse. Usually sits in the ground but can also be mounted on top of a wood, concrete or brick frame/wall to provide 5” of additional inside height. •	Top shelving: Shelving with polycarbonate inserts (for more light): 10” deep. o	Two options: twin-wall polycarbonate inserts (flat), or heavy duty seed trays – to make starting seeds and transplanting easier. •	Additional Roof Windows with Automatic Openers: recommended in areas where temperatures will reach over 95º F when still using the greenhouse (we also recommend you use shade cloth as well, especially during the summer).